Detailed regulations in the draft raise the prospect of a possible perpetual state of emergency hinging on a perception of personal threat. 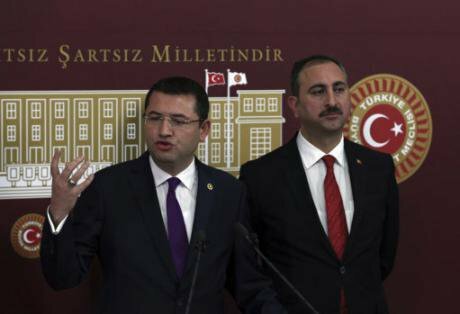 AKP lawmaker Abdulhamit Gul, right, and MHP lawmaker Mehmet Parsak speak to the media about the constitutional amendment bill in Ankara, Turkey, Saturday, Dec. 10, 2016. Burhan Ozbilici/Press Association. All rights reserved.In the last month of 2016, Turkey’s ruling Justice and Development Party (AKP) and the fourth biggest party, the National Movement Party (MHP) unveiled a controversial new draft constitution which aims at a total system change. Initially, the most striking changes include the strengthening of the presidency with several new powers and no accountability to the judiciary. Furthermore, the way is cleared for Mr. Recep Tayyip Erdoğan to rule the country until 2029, and who knows – maybe even longer. According to the two parties’ leading figures the primary objective of the proposed constitutional amendment is to establish sustainable stability by erasing the components of military and bureaucratic tutelage in Turkey, as if Turkey’s dominant and hegemonic leadership were fundamentally different in nature. 2016 was one of the most difficult years for the people of Turkey. More than ten terrorist blasts occurred in big cities including İstanbul and Ankara. The eight MP’s of the Peoples’ Democratic Party (HDP) got arrested, including co-leaders Selahattin Demirtaş and Figen Yüksekdağ, Turkish lira took a battering as Turkey’s GDP shrunk by 1.8 per cent in the third quarter, and the economy turned in its worst performance since 2009. Last but certainly not least, on the night of July 15, Turkey’s army attempted a coup d’état primarily against Erdoğan, and the AKP government. Despite the fact that the coup was prevented almost on the same day, 265 people lost their lives and more than 3000 were wounded. Five days after the coup attempt, the AKP government declared a state of emergency for three months which was later extended for another three months. However, in nature and scale the measures far exceeded any justifiable response to the coup attempt. Within the first three months of the state of emergency, 35 medical establishments, 934 private teaching institutions, 109 private student dormitories, 104 foundations, 1125 associations, 15 private universities, 19 unions, 45 newspapers, 15 journals, 18 TV stations, and 29 publishing houses were shut down. After five months of exceptional measures taken under the blanket of the state of emergency, AKP, the ruling party and its collaborator MHP drafted a constitution without the consent of the other parties in the Parliament. This means that if the draft becomes Turkey’s constitution after due process, it will be both majoritarian and exclusionist in nature. The Republican Peoples’ Party (CHP) and the HDP, the two leading opposition parties in Parliament, and nearly 50% of public opinion according to the polls, vehemently oppose transferring Turkey’s executive authority from the Parliament to a presidency — which they claim would establish a dictatorship under Mr. Erdogan. They also allege that the proposal weakens existing incentives for political compromise by guaranteeing one-party rule, destroying minority parties and weakening checks-and-balances. Furthermore, the proposed constitution amendments are aimed at a structural regime change that would probably deepen polarisation instead of solving some deep-seated social and political disputes. What is new in the proposed constitution? Prime Minister Mr. Binali Yildirim said to the press on December 10, 2016, that the amendments meant an end to coalition governments, adding that “Parliament ... is being strengthened, while the presidency, in charge of the executive branch, is being restructured to end conflicts between branches… There will only be strong leadership now”. These statements constitute a certain irony since there is no room for a prime minister in the proposed draft. The amendment, which was submitted on the same day by 316 signatures to the Speaker of the Parliament for subsequent presentation to Parliament, grants the President sole authority to issue decrees, declare states of emergency, rule the country with resolutions during states of emergency, and appoint public officials as well as half of the high judges. First of all, according to the draft, the President will have the power to issue presidential decrees on issues related to executive power; and neither an empowering law nor a ratification (except in times of a state of emergency) to be issued by the Parliament is required for those presidential decrees. However, fundamental rights, individual rights and duties included in the first and second chapters and the political rights and duties listed in the fourth chapter of the second part of the Constitution, shall not be regulated by presidential decree. Any regulation specifically required by the Constitution to be legislated on by the parliament shall not fall within the scope of presidential decrees. If the Parliament issues a law on that specific topic, the presidential decree shall become null and void. Nevertheless, it is fair to say that the draft “hints” at a sustainable state of emergency in which Turkey will be governed mostly by executive orders. Furthermore, this regulation reveals a new paradox and a very probable clash of powers, since the current Constitution’s Article 7 giving legislative prerogative to the Parliament is still in force. Reading the draft however, even the powers of Parliament with respect to legislation look questionable. Powers granted to the President to send laws back to the Parliament that, in whole or in part, he deems unsuitable for promulgation constitute in effect a veto power. In order to adopt a law that has been sent back by the President for reconsideration, the Parliament needs 301 votes in a proposed 600-seat parliament, which has 550 members in its current configuration. This means that the Parliament will not be able to resist the initial legislation. Secondly, according to the draft, the President shall have the sole authority to declare a state of emergency. The state of emergency in the draft covers martial law as well as the state of emergency regulations that are present in the current Constitution. The President shall also have the power to rule the country during a state of emergency by exercising presidential decrees. With the request of the President, parliament may decide to extend the period for up to four months. In the event of a war, this four-month time limit will not apply. These detailed regulations in the draft raise the prospect of a possible perpetual state of emergency hinging on a perception of personal threat. Furthermore, the draft requires that the President be given the authority to restructure all ministries and public institutions. “The authorities and responsibilities of the public institutions and organizations within the scope of the central administration are regulated by presidential decree,” the amendment reads. This means that if the President gets to thinking that a ministry, let us say for instance the ministry of education, is not needed for one reason or another, he may abolish this simply by issuing a presidential decree. Criteria for appointments of senior civil servants will also be arranged by presidential decree. Moreover, since a definition of “senior civil servant” is yet to be drawn up, chancellors of universities, police heads and military force commanders may find themselves apparently caught in this bind. Additionally, the High Council of Judges and Prosecutors (HSYK) will be reduced from 22 to 12 members, while the president of the Council shall still be the Minister of Justice. The President shall appoint half of the members of the Board directly, while the other half shall be elected by the Parliament. The High Council of Judges and Prosecutors run all proceedings regarding the admission of judges and public prosecutors of civil and administrative courts into the profession, their terms of appointment, transfer to other posts, the delegation of temporary powers, promotion and promotion to the top jobs, decisions concerning those considered professionally unworthy, the imposition of disciplinary penalties and removal from office. It shall also take final decisions on proposals by the Ministry of Justice concerning the abolition of a court, or changes to the territorial jurisdiction of a court. This means that if the President and the majority of the Parliament happen to be from one political party, a single authority shall elect the members of high judicial bodies, since the President will be able to keep his position as head of a ruling political party. The scope for the accountability of the President does also get expanded. Under this proposed draft, impeachment proceedings against the President shall be commenced by the signatures of 301 deputies in the proposed 600-seat parliament. Parliament will be able to set up a commission of inquiry by secret ballot of 360 deputies. If the inquiry commission decides to send the President to the Supreme Court to face trial, the President will only be tried following a secret ballot of 400 deputies. These provisions shall also apply for proposals to be brought to the Parliament after the President’s term ends. In short, this procedure for ensuring the accountability of the presidency may as well be regarded as inapplicable. Apart from various amendments which will be focused on separately, like lowering the eligible age for being a deputy from 25 to 18, a last regulation to be mentioned in the draft is about re-election. Currently the elections are held every four years, whereas the draft provides for it to be every five years – for both the Parliament and for the president on the same day. Currently, Parliament may decide to hold a new election before the termination of an election period by a vote of 139 deputies, whereas the draft requires three fifths (360) of the proposed 600-seat parliament. This apparently offers only the slimmest possibility of going to an election in spite of the President. Elections may be renewed according to the decision taken by the President who shall have the right to be elected twice. If the President makes a call for a new parliament during his or her second term, he or she will be at liberty to pursue candidacy for a third time. There seems to be no obstacle in the draft for this process to be renewed by the end of each term; the President thereby enjoying his or her position for as long as he or she lives. Is the proposed Constitution brand-new? The first written constitution in Turkish history was adopted on 23 December 1876. This constitution, which carried the name of Fundamental Law, was not the result of a movement based on the will of the people, but was drawn up by the "Young Ottomans", the name given to the intellectuals who retained a rather strong influence over the sultan. According to the 1876 Constitution, unconditional, unrestricted sovereignty belonged to the Ottoman Family. The sultan's person was "sacred". Legislative and executive powers belonged to the sultan. The judicial power could be considered independent, but the right to grant "amnesty" definitely belonged to the sultan. All the basic rights were recognized for citizens excluding the freedom to gather, form political parties or organizations. However, as it was possible to limit these rights by legal means and because there was no rule governing this, there was no legal guarantee for basic rights and freedoms. Also, the life, goods, honour and immunity of the homes of citizens were guaranteed "within the law". Still, the sultan, as the result of a police investigation, could exile people abroad with the justification that they harmed the state. Thus, the judicial guarantee was also deeply flawed. So, shall we say nothing is brand-new under the sun?